It was an uncharacteristically chilly day for San Jose yesterday, as press and Cinequest supporters gathered on a patio at San Jose State. We chatted and noshed on meatballs, happy to be in one place again — film fans and writers, eager to find out what was coming to Cinequest 2017. Opening Night Screening and Celebration: Feb. 28, 7:15 pm, California Theatre: Mark Pellington (Arlington Road) presents his poignant, fabulous new comedy, The Last Word , starring Shirley MacLaine (Terms of Endearment, Mrs. Winterbourne, Postcards from the Edge) and Amanda Seyfried (Les Misérables, Big Love, Mamma Mia!). Pre-screening includes special presentations and Jerry Nagano filling the lavish California Theatre with glorious music from the mighty Wurlitzer organ. Post-screening festivities and fun will take place at The Farmers Union. Closing Night Screening and Celebration: March 12, 6:00 pm, California Theatre: Cinequest 2017 culminates with The Zookeeper’s Wife, directed by Niki Caro (Whale Rider, North Country ) and starring two-time Academy Award-nominated Jessica Chastain (Miss Sloane, Zero Dark Thirty), Daniel Brühl (The Fifth Estate, Captain America: Civil War), and Johan Heldenbergh (The Broken Circle Breakdown). Adapted from Diane Ackerman’s best-selling book, The Zookeeper’s Wife tells the tale of keepers of the Warsaw Zoo, Antonina and Jan Zabinski, who helped save hundreds of people and animals during the Nazi invasion. Pre-screening includes presentation of both the Cinequest Film & Cinequest VR Awards. Post-screening festivities and revelry will take place at The Hyatt Place San Jose Downtown. Maverick Spirit Award Events : Cinequest’s most prestigious accolade, the Maverick Spirit Award recognizes bold, visionary, and creative forces-those most compelling in the worlds of Silicon Valley innovation and the film arts. Previous guest recipients include: James Franco, J.J. Abrams, Kevin Spacey, Rosario Dawson, Harrison Ford, William H. Macy, Gus Van Sant, Spike Lee, Jennifer Jason Leigh, Sir Ian McKellen, Neil Gaiman, Alec Baldwin, and Sir Ben Kingsley. Please watch the Cinequest Maverick Spirit Award video to view clips honoring these exceptional individuals. Actor, Jane Lynch (Glee, Best In Show, A Mighty Wind, The 40-Year-Old Virgin ). Emmy award and Golden Globe winner, Maverick Spirit Award honoree Jane Lynch brings her very special presence to every project with which she’s involved. Multi-talented, statuesque, and undeniably charismatic, when she’s on screen, be it big or small, it’s impossible to take your eyes off her. A conversation with Jane Lynch and award presentation will precede the screening of her delightful new comedy, Writer’s Block, on Saturday, March 11, at 4:15 pm, California Theatre. Producer-Writer-Director, Jason Reitman (Thank You For Smoking, Juno, Up In The Air ). Early in his career, Jason Reitman established an amazingly simple credo: “I don’t want to make films that give you the answer. If there is a message to my films-and I hope there isn’t-it’s to be open-minded.” His screenplays and direction are masterful examples of subtle poignancy. A conversation with Jason Reitman (and award presentation) will occur as part of Cinequest’s Writers Celebration on Sunday, March 5, at 1:30 pm, Hammer Theatre. Virtual Reality : It’s fitting that Cinequest, the long-time leader in showcasing and implementing pioneering technologies that have revolutionized the film medium, would produce a vanguard VR & AR experience. 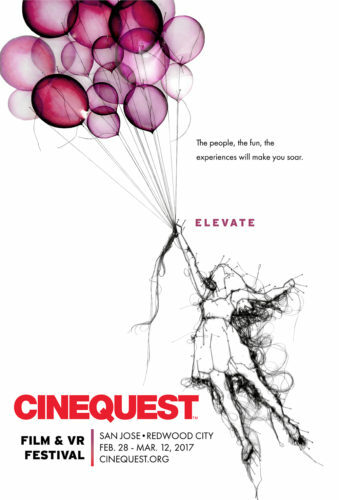 Cinequest’s Virtual Reality Experience features: 1) Workshops & Forums providing a major foundation/platform for emerging and established Artists & Innovators to understand the opportunities, how-to’s, and challenges present in VR & AR; 2) VR Cinema Audience Programs and a VR Canteen & Immersive Gallery, making available the latest, greatest VR movies, games, and interactive experiences to audiences; 3) The inaugural Cinequest VR Awards. Please see the Cinequest Virtual Reality Experience press release or visit www.cinequest.org/virtualreality for more details. New Redwood City Venues Added to Magnificent San Jose Theatres : Cinequest’s Board and Founders are proud to announce increasing the festival’s San Jose presence and services by increased utilization of the spectacular California and Hammer Theatres, as well as adding screenings and events at Cinemark Santana Row, Fairmont San Jose, San Jose Stage Company, and Uchida Hall on the San Jose State campus. Further increasing our screening venues, Cinequest is expanding to the gorgeous, state of the art Cinemark Century 20 in Redwood City. MR. INVINCIBLE – Starring Alyson Stoner (Cheaper by the Dozen, Step Up) and Bill Engvall (Blue Collar Comedy). Work-in-progress screening. We’ll have much more coverage coming… in the meantime, start making your plans to attend!